The Apostles' Creed mentions the Holy Spirit by name in two places. First, it says that Jesus was conceived by the Holy Spirit, and second it affirms belief in the Holy Spirit at the beginning of its third major section. Belief in the personhood and divinity of the Holy Spirit is a critical part of Christian theology. But did this belief develop over time, or has the church always affirmed that the Holy Spirit is an equal member of the Trinity? Well, the believing church has always affirmed the divinity of the Holy Spirit. It certainly shows up in the early Christian creeds. When you look at the Holy Spirit as presented in the New Testament, the reality is that it is impossible to understand the Holy Spirit as anything other than divine, and you understand the Holy Spirit is a person. It's not merely a vague spiritual force. This is a person, and when we talk about the Trinity and we come to an understanding of how the Bible explains the Trinity, what we really find in the biblical narrative is that the Holy Spirit is there, as Jesus says in the Gospel of John, "He sends the Spirit." And so what we have is a very clear understanding that wherever God is, the Spirit is present. And there is a very special sense in which the Spirit, as person, is the presence of both the Father and the Son for us today in the church. Has the church always affirmed the divinity or deity of the Holy Spirit? And one could answer that by saying, yes, because the Bible affirms the deity of the Holy Spirit and the Bible is part, of course, of the church. The data of Scripture is that the Holy Spirit is spoken of in terms that require us to believe that he has divine properties. And not only that, but Jesus himself in almost his farewell statement said, "Go into all the world and make disciples, baptizing in the name of the Father, and of the Son, and of the Holy Spirit," putting the Holy Spirit and the Son on a par with the Father. That's the data that the church takes several centuries to get right and some would argue that it took even until the time of the Reformation and some contributions even of the Reformer John Calvin to get the doctrine of the Holy Spirit perfectly right, if I can put it that way. But certainly by the third or fourth centuries doctrinally and "creedally," the church affirmed the deity of the Holy Spirit. My understanding is that there has never been any doubt that the Spirit of God is from God. And the Holy Spirit is divine. I think the thing that took a little longer for some believers to figure out, was that the Holy Spirit was not just an emanating influence from God, wasn't just a force coming outward from God, but was actually a personal essence, a person distinct from God the Father. And the personhood of the Holy Spirit that makes the Holy Spirit interactive and differentiated from, though not severed from the Father, was a breakthrough understanding that had tremendous ramifications for how we understood God himself and our relationship to the Holy Spirit as well. It's clear that the early church believed in the divinity of the Holy Spirit, and even affirmed it in the Apostles' Creed. But were they right in this belief? Does Scripture demonstrate that the Holy Spirit is fully God? At least four factors point to the deity of the Holy Spirit in the Scriptures. First, the fact that the name "Holy Spirit" is used interchangeably with God. We see that in Acts 5. Second, the fact that attributes of God are attributed to the Holy Spirit. The Spirit's omniscience is attributed to the Spirit in 1 Corinthians 2, omnipotence in Luke 1:35, eternality in Hebrews 9:14. Third is the fact that the Holy Spirit is included in the single name in which followers of Christ are baptized. And finally, there are certain works that demonstrate the deity of the Holy Spirit, and I'll briefly mention four. First, in John 16 we're told that the Spirit judges. Yet, we know that judgment is a prerogative that belongs only to God. Second, we note in Psalm 33:6 that the Spirit is involved in creation. And yet the act of creating is something only God can do. In John 3 we see that the Spirit regenerates, that he brings about the new birth, and yet this is something that only God can do. And finally we know from 2 Timothy 3:16 that the Spirit inspires the Scriptures. And yet only God can reveal himself to us. Together all of these factors point to the deity of the Holy Spirit. The Holy Spirit's divinity can be shown and demonstrated through his work in creation, through his work in Scriptures, through his work in salvation. In creation the Spirit is mentioned alongside God — who we would say, "God the Father" — as one who is present and participating in creation. And only God creates. And so the Spirit's presence and participation helps us understand that he is divine. And then in the inspiration of the Scriptures. The Scriptures are the Spirit's book, but we speak of it as God's Word. And yet it is inspired and providentially superintended, put together, by the Holy Spirit. And then in salvation, divinity is implied or demonstrated by God's participation in salvation and the way the Holy Spirit participates, he was active in the conception of Christ, he empowered Christ's ministry, he raised Christ from the dead, he made Christ's atoning sacrifice powerful and possible. So that amplifies our understanding of his divinity. So, not only in providing salvation, but in producing the church. The Holy Spirit birthed the church. The Spirit empowers the church. The Spirit makes the church into the body of Christ. Individually in our salvation, the Holy Spirit is active. The active regeneration is spoken of as being "born of the Spirit." The Spirit empowers us. The Spirit produces the character of Christ in us. The Spirit raises us on the last day. So, corporately and individually, salvation is very much the work of the Spirit amplifying and demonstrating his divinity. It is very important for us to believe that Holy Spirit is God; the Holy Spirit is God the third person. And we can see that through the works, the mighty works that he does in the world and in our lives. First of all, the Bible tells us very clearly in Romans 8:28 that "all things work together for the good of those who love God and are called according to his purpose." So everything that happens in our lives and in the world is sovereignly designed, ruled over, by the Holy Spirit. The Holy Spirit rules over everything that happens in our lives. He is God. He is not some liquid, some gas. He's not just a wind, even though that is his name. The Holy Spirit is a person who is involved in everything that happens in the world. A bird falls to the ground; one of our hairs falls off our head; the Holy Spirit is there. God, in his eternal plan, had planned that event, and God is there when it happens to rule over it. The fact that some of us trust in the Lord Jesus Christ, repent of our sins and receive baptism and join the church, for example, that's the work of the Holy Spirit. That's the result of the work of the Holy Spirit. The Holy Spirit is God. He turns that stony, that hard hardened heart of ours, and gives us a new one so that we are now enabled to repent of our sins and trust in the Lord Jesus Christ. So, repentance and faith are gifts, they are the results of the work of the Holy Spirit. Again, the Holy Spirit is God. He is the one who changes our nature, our minds, our wills, our hearts from deep within. The Holy Spirit not only begins that work in us — in the fact that we are born again, in regeneration — the Holy Spirit not only gives us a new heart, he continues to change us as we live out of that new heart. Someone has described this process, sanctification, this way: it's a little bit like an old house. There is a TV program in the west called "This Old House" where you change a little bit of the kitchen today and the roof tomorrow, the living room the third day and eventually at the end of the process we have a new house. The Holy Spirit renovates. He renews our hearts that way. That we are already new, now that's where the example falls down. We are already a new person, and yet the Holy Spirit continues to make that person new. He gives us the strength to say "no" to sin, and so, "yes" to God — say "yes" to God — and to say "yes" to obedience. And only God can do that. The Holy Spirit is God, and he does those mighty works in our lives and in our world. He rules over every event. He saves us, literally. He brings salvation that Jesus Christ earned into our lives and makes it ours. And he continues to change us until we meet Jesus someday. 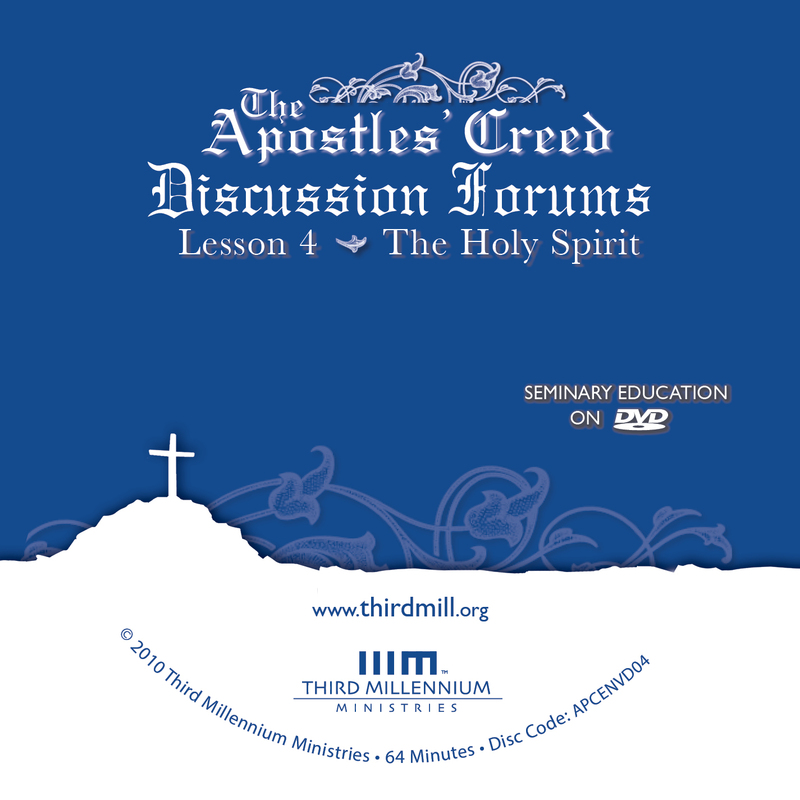 What are some aspects of the Holy Spirit's divine work that are most beneficial to believers? A rich understanding of the Holy Spirit's divine work can benefit us in many ways. It helps us appreciate the grace he has shown to us. It encourages us to love and trust him. It teaches us many of the ways he can and will bless us. So, what are some aspects of the Holy Spirit's divine work that are most beneficial to believers? When we think about the person and work of the Holy Spirit, we think about the full range of who God is and what God does. But I think as far as our human experience is concerned, there are several key things. The first is that the Spirit brings God here and now to us. To think of our heavenly Father can sometimes make God distant — where is that heavenly Father? Where is heaven? — But the Holy Spirit says, God is here, not there. But it is also now. If we think of God the Son, we can think of a historical figure two thousand years ago. But, the Holy Spirit comes and says, that's true, but I'm also with you always, even to the end of the age. So, the here-and-nowness of God comes to us through the Holy Spirit. I think another thing is that the Holy Spirit brings all the things of Jesus, and instructs us in those things so that we can grow in Christ's likeness. We can begin to have the mind of Christ. We can see the world with the eyes of Christ and hear it through the ears of Christ. That instruction in Christ's likeness is very important as I attempt to follow Christ and to be his witness in the world. And that leads, I think, to the understanding that through the Spirit I am part of this enterprise, and so, I don't live as a careerist, I live with a call. I live in response to grace and the response to invitation. And it is that Holy Spirit that keeps wooing me to think of my life vocationally. And that is an exciting thing. Both the desire and the power to live for Christ comes from the Holy Spirit. The Holy Spirit is the one who gives us the "want to," the desire to obey God. The fact that we would ever want to follow Christ, to get into the Word of God, to pray, to witness — all those things — we give the credit to the Holy Spirit who gives us the desire, but also the power, to do so and to understand that he is the motivator. He is the one who strengthens us. There is an interesting passage in the last verse of Colossians 1:29 where the apostle says, "For I labor, striving according to his power which works mightily within me." So, Paul was the one laboring — "For I labor." In the morning, Paul was the one who felt like he was going to the Word of God. Paul was the one who ended the day, who was tired, and yet he was doing so according to God's power so that he recognized at the end of the day the fact that I wanted to do this was from the Holy Spirit. The fact that I had the strength to do this was from the Holy Spirit, and all the glory was to him. So, Paul was the one who felt like he was doing all the laboring. Paul was the one who was tired, but he acknowledged at the end of it all that motivation, that the power and all the glory was from God. The Holy Spirit's role in our everyday lives as Christians, I think, is fundamental for what it means to be a believer in Jesus Christ. When we look at the New Testament, the New Testament particularly emphasizes that the Holy Spirit strengthens us in our everyday lives to please Jesus Christ and God the Father. In other words, where does the strength come from day by day to put our trust in God and to obey him? What the Scripture teaches is that that strength does not come from ourselves. We must be filled with the Spirit. We must call upon the Holy Spirit to strengthen us. I think this is enormously practical because we sense as believers that in and of ourselves we have no strength. In and of ourselves we cannot please God. We face each day recognizing, I have no strength from the day before. I need a fresh empowering for the doing of God. I need a fresh endowment from on high. And the Scriptures teach us we receive that from the Holy Spirit. He gifts us. He sanctifies us. He strengthens us. He helps us put our trust in Christ every day. The work of the Holy Spirit is a rich truth indeed, and I'm only going to select certain things from a host of other things. The first is that the Holy Spirit gives us life. Jesus says in John 3:5, "…unless a person is born of water and the Spirit, he cannot enter the kingdom of God." In John 6:63, Jesus says that it is the Spirit that gives life. And in Titus 3:5 are the same references in John 3:5. Paul says, "Not by works of righteousness which we have done, but according to his mercy he saved us by the washing of regeneration and renewal by the Holy Spirit." So he enables us to live, but he also enables us to see. We read in 2 Peter 1:21, the Old Testament prophets spoke from God as they were carried along by the Holy Spirit, which implies that the Holy Spirit given to the church will enlighten us to understand what he inspired in the prophets. There's no new revelation, but if we're to understand existing revelation we must be enlightened and empowered by the Spirit of God. So Jesus in John 14:26 says, "Helper, the Holy Spirit whom the Father will send in my name, he will teach you all things." And in 1 Corinthians 2, the apostle Paul says, "The Spirit searches the depths of God…and we have received the Spirit who is from God that we may understand the things that are freely given to us by God." So he enables us to live and to see, but also he enables us to pray. There in Galatians 4 Paul says, "God has sent forth the Spirit of his Son into our hearts, crying 'Abba, Father.'" The Spirit cries there on our behalf. And so when we come to Romans 8:15 Paul says, "…you have received the Spirit of adoption, by whom we cry, 'Abba, Father.'" If the Spirit doesn't cry "Abba, Father" on our behalf, we cannot do so. And later in Romans 8, Paul says, "We do not know what to pray for as we ought, but the Spirit intercedes for us with unutterable groanings." I find that extraordinarily reassuring that the Spirit prays on my behalf and also prompts my own prayer. The Holy Spirit is one of the divine persons of the Trinity, a full member of the Godhead. And it's clear that his divine work benefits us in many ways. But what difference does it make that he's a distinct person from the Father and the Son? Do Christians benefit from the fact that the Holy Spirit is a person? The fact that the Bible teaches that the Holy Spirit is a distinct, divine person and not just a mode of expression of the one God or a phase of his manifestation is very, very significant for the Christian life. For one thing it means that we are indwelt by a person not by an impersonal force. There is a person who is indwelling us, to whom we may relate, and who is in an everlasting relationship with the Father and the Son. I'm struck, for instance, by the Gospel of Luke in its account of Jesus' baptism. Luke goes out of his way to tell us that when the Holy Spirit comes from heaven and descends upon Jesus in the form of a dove, Luke tells us that he came in bodily form. Now, just from reading the other gospel accounts, you could have maybe made the argument that this was a visible manifestation, maybe it was a vision, but maybe it wasn't actually something that had substantially happened there. Well, you can't say that after you've read the Gospel of Luke. And one of the great old 16th century commentators made the point that the reason that Luke draws attention to the fact that the Holy Spirit came in bodily form is to emphasize that all the persons of the Trinity are there present at the baptism of Jesus and that those persons are not forces or powers. They're persons. God the Father is speaking. God the Son is being baptized. God the Spirit is present in bodily form and manifestation. And the idea is that these three persons relate to one another personally and to us personally. It's all the difference in the world to have a relationship with another person than to feel the power of a force. And so in the Christian life, the Apostle Paul will tell us in Ephesians 3:14-19, that the person of the Holy Spirit is dwelling in our hearts by faith, in order to make our hearts to be a suitable habitation for Christ. So the picture is that the person of the Holy Spirit is making our hearts, our lives, the very inmost aspect of our being, to be a place where the Lord Jesus Christ would feel comfortable and at home. Now, I think that many of us have had friends that were good at home remodeling, fixing up old clunky homes that were out of date in style, and pinching pennies and turning them into really lovely homes. I have a friend who's really good at that, she can go into a place, it can be outdated, it can be horrible, she's a penny pincher, she can save a little here, save a little there, put up some wallpaper here, fix this there, and after five or six years she can really turn a place into a different place. Well, I remember a home that she bought and it was horrible. It was absolutely the most ugly thing I'd ever seen. And I went in after she'd been in that home for five years, and I walked into the house and the house looked like her. In other words, I could have predicted how she would have decorated the house because I've seen other houses that she's done, and it's the same way with the Holy Spirit. The Holy Spirit is at work redecorating our hearts, transforming us so that we have lives in which Jesus would be pleased to be at home and dwell. And that's the work of a person, not of a force. When we affirm the distinct personal nature of the Holy Spirit, we are affirming that the Father is God, the Son is God, and the Holy Spirit is God. Each one of them are persons. This has very, very practical implications for our Christian lives, particularly in relation to the Holy Spirit. It shows that the work that he does in us — from regeneration to bringing us to Christ in terms of our union with him, from dwelling within us, transforming us, as Scripture speaks of him as the deposit, the guarantee of our inheritance, the precious gift of the Spirit — all of this is made important to us and practical to us in the fact that he is personal. He is not a force. He is not some impersonal means. He is the one who comes to us personally, who gives us new life, who dwells within us, who bears witness of Christ, who comforts us, who transforms us. And indeed, his work as a distinct person, and a personal work, is that which can give us comfort, hope, confidence in this life. All of those are very, very important practical implications of viewing his work and his person as that which is distinct from the Father and the Son, yet though related. The Bible clearly teaches that the Holy Spirit is both divine and a distinct person from the Father and the Son. He's not just some force that emanates from the Father. He's a person, and as a matter of fact, the Holy Spirit is the essential person at work in the church today, applying the work of Christ in very real ways. Jesus said, it's to your advantage that I go so that the Comforter can come. And when he comes he brings a power to the lives of believers. And he brings regeneration. He's the one who inspired Scripture and illumines the minds of believers to understand Scripture. And without him nothing of lasting value happens. We can often be practical "binitarians" as Christians and not Trinitarians with a holistic, robust belief in the Trinity. And so it's essential that we depend on him and his work today. One of the most amazing things the Bible teaches about the Holy Spirit is that he "indwells" us or lives in us. This is an astounding concept. But what does it mean for us? What are some personal and pastoral implications of the Holy Spirit's indwelling? The indwelling presence of the Spirit has enormous pastoral and personal implications when we realize what that actually means, that God promised, that Jesus promised, to give us his Spirit, his presence within us. So everywhere we go we have God's presence within us, God's power to accomplish his purpose, God's words to share with others, to constantly be aware that we are Christ's representatives. When Jesus left this earth he told his disciples that it was good that he was leaving because they would not only do the works that he did; they would do greater works. That's an astonishing statement, to think that God's people can do greater works even than Jesus did. And the reason for that is that we have his presence within us. If we live in dependence on him, if we lived filled with the Holy Spirit, we can accomplish his purpose and honor it. That's an amazing thought. You know one of the miracles of being a Christian is that into our forgiven lives, God gives us the greatest gift of all. He gives us his own indwelling presence. And that indwelling presence of God is the indwelling Holy Spirit. And the question is, what difference, what practical difference does it make that a believer has within them the Holy Spirit? Well, one of the things that I would say to answer that is that is you have to think of what is the Holy Spirit's agenda, so to speak? Is he there just to comfort us and to assure us that we are the children of God? Certainly he has this testifying ministry that assures us that we belong to God, and this gives us tremendous confidence. Oh, it's a wonderful thing to know that you are connected with God for all time, that you belong to him body and in soul, in life and death, and all that stuff that the Heidelberg Catechism says so well. But there's another thing that's on the Holy Spirit's agenda. He's not just an idle presence. He is a transforming presence. And he will not permit us to grow comfortable with sinful behaviors and immature dispositions and self-centeredness that is alien to his own holy nature. He is not called the Holy Spirit for nothing. And so where the Holy Spirit dwells is constantly in the improving and transformation business. There's another thing the Holy Spirit's actively doing. He is actively empowering us to understand and find the courage and the skills to fulfill the will of God. So, if I could summarize it, the work of the indwelling Holy Spirit is partly a connecting ministry of uniting us with God and with others, a reconciling kind of dynamic. It's a transformational dynamic making us holy and whole. It's a vocational dynamic of calling us and empowering us and sending us, so that he is connecting, he is changing, and he is enabling us to do. Now why do I mention all of this work of the indwelling Holy Spirit? Because we are challenged in the inspired New Testament to keep in step with the Spirit. And how do we align ourselves with the work of the Holy Spirit? Partly by understanding what his agenda is. His agenda is a uniting ministry, a transformational ministry, a vocational ministry, and knowing what the Holy Spirit is up to, what his plans are, what his priorities are make it easier to keep in step with the Holy Spirit. It's one of the great truths of the New Testament that the Holy Spirit dwells in the life of the believer. I find one of the most fascinating passages where Paul talks about that the gospel is about "Christ in you," Christ living in you. And he speaks in other locations about the Spirit of Christ indwelling the believer. I used to think sometimes, well, maybe this is just a metaphor, but the more I thought about it, this is actually a spiritual reality. I and every believer on this planet is someone in whom the Spirit of Christ actually dwells. And my personality is something which is filled with the Spirit of Christ. This is not a metaphor; this is actually a reality. And the implication of that is, well, many things. We are never alone. We've always got someone with us, Christ living within us. We're never totally powerless. There is within us the power of the risen Christ, his Spirit. We are never without the fruit of the Spirit. The fruit of the Spirit grows out of us. And that transforming power is within us, and we don't have to rely on our own energies to try and live the Christian life. We can actually be resourced to do so in the strength that Christ supplies through the same Holy Spirit. So, the pastoral implications of the Holy Spirit? Everything. And the Christian life without the Holy Spirit? Impossible. One of the signs of the Holy Spirit's indwelling is the evidence of spiritual gifts in a believer's life. The precise nature of some of these gifts is debated among Evangelical Christians, but it's generally agreed that all believers have at least one gift from the Spirit. But what's their purpose? What are we supposed to do with our spiritual gifts? The gifts of the Holy Spirit are, of course, a matter that Christians may disagree on in various respects as to which gifts are present now, but I think we can all agree on the purpose of the gifts of the Holy Spirit, and how, therefore, we should be using those gifts. If we look just very carefully at 1 Corinthians 12–14, I see four things there that Paul emphasizes for the church at Corinth — an abundance of spiritual gifts, but is not always using them as God intended them to. The first one, obviously, is from the fact that Corinthians 13 is embedded right between chapters 12 and 14. Paul's point is, love is more important than the manifestations of the spiritual gifts. Love will last. The spiritual gifts will not last into eternity. Love is the thing that is at the very heart of what it means to be filled with and to be being filled with the Holy Spirit. Love is at the very apex of Paul's emphasis there. Now from that, of course, Paul has already anticipated what he's going to say about love when he goes in chapter 12 to emphasize the purpose of the gifts is always to build up others; it's to serve others in love. It's not my personal fame, it's not my personal gratification, it's not my personal glory. It's to be using the abilities that the Holy Spirit has given to me to serve others and to build them up in the faith. So that's a second crucial element that we need to remember. Thirdly, and Paul makes this point very clear as well, the most visible gifts do not necessarily make the person who exhibits those gifts more valuable in the eyes of God. The high visibility gifts don't make that particular member of the body more essential, more crucial, more treasured by God, than those who have behind-the-scenes, low-visibility gifts. In fact, Paul argues, using the analogy of the body, sometimes actually the less visible gifts are really to be treated with greater honor. And so, again, to put people's personal value keyed into, monitored by the way in which their gifts are manifested, is a mistake. Paul says, no, all of the gifts are part of the body. Every member of the body is to be treasured and is to be used. The fourth thing that comes from that is Paul's word particularly to the less visible members of the body where Paul says, just because you don't have one of the gifts that everybody notices, that doesn't let you off the hook from serving others with whatever gift you do have. Be grateful whatever gift the Holy Spirit has given to you and recognize that other members of the body need you to be exercising that gift in service to them. So there's a warning to those with visible gifts — don't think you don't need others; don't think you're more valuable to others. Paul also gives a warning to those with less visible gifts — don't think you're not needed; don't think you can sort of just sit back and coast and let others do all the work. Your gift is needed for the health and the growth of the whole body of Christ. You know I think the most important thing to understand about the spiritual gifts is that they're not about ourselves. They're about the church, and these gifts are given to church. They're distributed among believers. But you know, given the way we think, we tend to think of the gift as ours — Her gift is hers. His gift is his — when in reality the church is given these gifts and they're distributed. It's like being in a family where we are all inheritors of the same wealth. We are all a part of the same family. We all eat at the same table. But somebody can bring this dish, and someone can bring something else. Someone will prepare the food, and someone will clean the table. The gifts are what we give to each other, and the real miracle of the church is where all these people who are so ungifted on their own — we would have nothing to offer except that God gives us these gifts — and we come and we offer them to each other. When the gifts become a divisive issue in the church, we can be absolutely certain that what is wrong in the first place is that we have forgotten that this all about what is given to the church. It's given to all of us. These gifts are given so that the church would more faithfully glorify God. When we understand that, we won't get in trouble over who has what gift. We will be, instead, rejoicing that the gifts are given to all of us through each other. The spiritual gifts are meant to fill up the body of Christ, meant to edify God's people, to accomplish God's purpose on earth. So, even though spiritual gifts edify ourselves — they are self-edifying because we feel joy when we experience God's presence in our lives. When we accomplish God's purpose we are going to feel fulfilled. We are going to feel joy — so, they are self-edifying, but we have to realize that's not their ultimate purpose. Their ultimate purpose is to build up the body of Christ, build up other believers, and then to ultimately accomplish God's purpose on earth. Spiritual gifts are meant to build up the body of Christ so that the entire church can benefit from them. But what about the unbelievers in the church? Does the Holy Spirit intend his gifts to bless them, too? Do unbelievers benefit from being involved in the life of the church? Well, Jesus tells us that in the church there will always be tares among the wheat, unbelievers present with believers. We can't always tell those apart, but we can assume that if someone's an unbeliever functioning in the context of the church, they will experience the common grace of God in powerful ways, and hopefully those common ways of seeing God will lead to saving grace in their lives. When you think about the life of the church as the people who are the people of the gospel, you could say, the people who live in the life of God in Christ, those who have heard the gospel, listened to the gospel, responded to the gospel. We have a context for thinking about the relationship of those who are unsaved in the life of the church, but participating. And the way we should think about that in terms of what it benefits them is this: It truly places them by God's providence in the context in which they can hear the gospel, in which they may see the gospel lived, in which they may encounter what Jesus Christ alive in the fellowship of a group of people looks like. And therefore, in the sovereignty of God, perhaps that is his mechanism to bring someone before they are saved into the life of the church so that they can respond to the gospel. So that is one way that a person who is unsaved benefits by being involved in the life of the church. But I think there are other ways that an unsaved person, whether or not he or she responds to the gospel, benefits at least in this life by being involved in the life of the church. And it is in this regard, if a church is truly living the love of Jesus Christ, if a church is truly teaching what it means to be alive in Christ, then in some way, those teaching themselves begin to inform some of the values that an unsaved person has. So it could end up having a great impact on the way that person treats his or her children, or the way that person relates to her husband or her friends. So, in the long run it is a tragedy that a person who sat in the hearing of the gospel did not respond to gospel. It's a great sadness. But by the same token there are even some benefits to the gospel being heard in a person's life that are not ultimate benefit, but in this life do provide an improvement for their lives. The Bible tells us that all people — whether they're part of the Christian community or not — all people are aware of God's power and divinity. And one of the main reasons for this is that one of the Holy Spirit's works is to reveal God to human beings. When he does this by inspiring Scripture, we call it "special revelation." But when he does it through various aspects of creation, we call it "general revelation." What kinds of truth does the Holy Spirit reveal through general revelation? You know, the world is filled with the revelation of God. As the Psalmist says, "The heavens are telling the glory of God." The reality is that every atom and molecule in the universe testifies to the glory of God. We refer to this as common revelation or general revelation. It also is a revelation that is itself a testimony to the fact that God, by his very nature, reveals himself. The Holy Spirit is present in creation. It's impossible to explain, I believe, why the atom and the molecule even hold together but by the power of the Holy Spirit, the very Spirit of God. The Holy Spirit, in terms of general revelation, convicts of sin. I mean this is just a very important issue here. And so, you take the Holy Spirit out of the equation, then there is no conviction of sin, there is no coming to Christ as persons, or drawn to Christ. Insofar as general revelation is used of God to prepare persons for the gospel, the Holy Spirit is active in that, but we need always to be reminded that special revelation is what is necessary for us to come to a saving knowledge of Jesus Christ. But let's also remember the general revelation that Paul tells us about in Romans 1 is sufficient to damn us. It is sufficient to condemn us, because no one is gonna be able to say, "I didn't know." It was written throughout every particle of creation. In addition to revealing truths about God through special and general revelation, Christians also acknowledge that the Holy Spirit helps individuals understand God's revelation and will by providing illumination and inward leading. Illumination is essentially when the Spirit enlightens our intellect. But how does this work? How does illumination affect our understanding of God's revelation? One of the very precious and important ministries of the Holy Spirit is the ministry of illumination. The great theologian John Calvin described illumination in a way that I think has stood up very well over time. He said imagine that you have a book open before you and it's a dark room, and you're looking at the page and you cannot make out the print. But over your shoulder comes a spotlight and it shines on the page and then it bounces back into your eyes, and so you can see and understand it clearly. That light over the shoulder, enlightening the text of Scripture so that your mind is opened, and to deeply understand, not just what it's saying, but how it may apply to your life today, this is the illuminating work of the Holy Spirit. And it's a wonderful combination, you see. The Holy Spirit who inspired the original composition of the Scriptures is now actively present in the present tense enabling your mind to apprehend the meaning that was originally implanted there, just for you. If we approach the Scriptures without dependence upon this vital ministry of the Holy Spirit, there's a good chance our sinful minds will be blinded to its deep meaning. There's a good chance that our capacity for rationalization and bias and willful rejection of truth that might cost us something, will keep us from really seeing in that spiritual sense. When we read the Scriptures, we can read them as secular people. We can study the Scriptures intensely, academically, using all of the scholarly tools. And all of that is enormously helpful and valuable. We should study the Scriptures with our minds. We should employ the scholarly tools that are out there, that assist us to understand the Scriptures. But every seminary student can tell you, or Bible school student, or ordinary Christian, that such study without the illumination of the Holy Spirit finally doesn't touch the soul. So we, as believers, we also need the Holy Spirit to take that Word and to seal it home to our hearts. I know I've had the experience of reading the Bible and coming away without having met God. I think that we meet God particularly when the Holy Spirit illuminates his Word to us so that we see Christ, so that we savor Christ, we sense our sin, we confess our sins before him. So, I think a very helpful thing to do as we read and study the Scriptures academically is to pray. We pray to God the Father, the Son and the Holy Spirit to illumine us. We pray that the Word would be opened to us because we've all had the experience of reading and that doesn't happen. So we ask the Spirit to help us. The Holy Spirit illumines us when he enlightens our intellect. But sometimes he works in ways that influence our emotions and intuition. Theologians normally call this "inward leading." What role does inward leading play in a Christian's life? I think illumination and the inward leading of the Holy Spirit are critical dimensions of a Christian life. And sometimes, particularly Christians in the West, I think, we become so scientifically minded, so objective, that we are afraid of the guidance and leading of the Holy Spirit yet the Bible makes it perfectly clear, the Spirit is God's presence in our lives, guiding us, directing us, instructing us. We need to be open to God's presence in our lives, to that guiding and direction from the Holy Spirit. He is a real presence within our lives. In 1 John, John says, you know the truth because you have an anointing. And so that confirms the truth. That anointing is the presence of the Holy Spirit. So ultimately it's not the evidence that we muster, it's not the scientific data we collect. It's the inward testimony of the Holy Spirit that confirms the truth to us. You know, the Christian life is more than drawing logical inferences from the text of Scripture. We live in the present and we are deeply enriched by the text and the truths of inspired literature written to people who are now dead. But what the inner leading of the Holy Spirit will do is take the truth and the principles of God's holy Word and help us understand what they mean for us today. The dynamic of a living relationship with the Holy Spirit far transcends, though it includes, the disciplines of good, biblical exegesis. The Holy Spirit is, in a sense, Immanuel. He is "God with us," guiding us in this existential adventure of the journey of life. We are not alone; we are people of a book. But we are people who've been privileged to be the friends of God. The Holy Spirit, using the basis of his holy, inspired Word, does lead us in our daily activities to know what's the right thing to do in this action or that action, by his inward witness and his inward impressions that he gives us. But these are always based upon his Word. So, the Spirit's inspired Word leads us to be illumined for the activities and actions and directions of our daily life. And he speaks to us by assuring us with his peace that a certain action is consistent with his will. He often helps us to find other people, Christians who can confirm an interpretation of Scripture or through their experience can lead us. But I would like to emphasize that inward leadings and illumination are always consistent with the Scripture. They're not above and beyond or contrary to, but based on the written Word, he gives us individual leading and guiding by his Spirit. The Holy Spirit's illumination and inward leading are vital to our Christian lives. But isn't it possible for Christians to mistake the source of their ideas and feelings? How can we verify the illumination and inward leading we think we've received? I think in my prayer life, one of the biggest questions that I have is, when I receive an impression, an insight, a thought, some sense of guidance or counsel, how do I know it's from God? Oswald Chambers got me over the hump on this when he basically says that, if you are a devoted follower of Jesus Christ and if your heart is to do the will of God, so far as you understand it, then don't agonize over that feeling or question. Don't become scrupulous, is what he says. I think of it as taking your pulse, you know, always wanting to make sure that you are counting the heart, you know. Your heart just beats. It just beats. And, you know, you don't count your respiration — how many times did I breathe in the last minute? You just breathe. And, so, Oswald Chambers, when it comes to, how do we know, really says, don't worry about that a lot. Don't become overly scrupulous in trying to figure it out, because God uses the natural processes of your thought life. God created us with brains, and minds, and hearts. And so, God uses those things. They're not antithetical. In fact, they may be the landing places for God's revelation. And that helps. But it doesn't completely solve the problem because we can presume. Some very tragic things have happened in the church, when people have said and done things, thinking they were doing them under the inspiration of the Holy Spirit. So, when we do come to those points, ordinary things, routine things, say a good word, do a kind deed, we don't need to wonder whether God is inspiring us to do that very much. It is just what we know we should be doing. But, when it comes to more critical things, then I think it's very important that we take those things to Scripture. God is not going to ask us to say or do something that violates his written Word. Every now and then we read a tragic story in the newspaper about, "God told me to kill my family," or something, just these bazaar acts of deranged people. And, when I read those I think, you know, if that person had just squared that with Scripture, it would have never happened. In issues of my life where it is not so natural, not so routine, not so everyday, another thing is to submit it to the tradition. There is a treasure trove of wisdom in the tradition. Sometimes it's harder to find, because it's not always indexed, and there's not a concordance. But it's not that hard to find either. If you really want to find it, it's there. And I tell the students, we need to be surrounded by that great cloud of witnesses because they will speak words to us that not only encourage us, but they'll also create some limits and boundaries around our lives, and that is very important. Then the third thing I think is, just to sit down with another Christian friend, and say, "I have been thinking about this," or "I have been bothered by this," or "I have been wondering about…What do you think about this? "… "How does this feel to you? "… "Would you go in and talk to your boss about this if you were me? I mean, what would you do?" Because in some ways, those two minds are better than one. If you get two people who sincerely desire the will of God to be done on earth as it is in heaven, sometimes the best advice you get is just from another sister or brother who gives you a "yes" or a "no" or maybe a "not now." I think those are at least reasonable ways that we can receive impressions, and act on those impressions, with confidence. It's quite natural and normal for every born-again Christian to feel that the Lord has touched me, prompted me, led me, urged me, to do something or to have a certain experience. You know every born-again Christian, ever since Adam to the end of the world, needs to feel that God is alive and that the Holy Spirit is alive in my heart and in my life. However, how do I know that this feeling, this urge, this prompting, is from the Holy Spirit? How do I know that it is not my own interpretation or even something that comes from the Devil? Well, the Bible provides us with an answer to that question. The Bible tells us that God's Word, you know, God's Word, the Bible, is completely inspired by the Holy Spirit. God's Word, the Bible, is the only guide and rule and standard for our experiences, for our feelings, for these urges and promptings that we have. In fact this guide is infallible. It could not possibly be wrong. It cannot possibly mislead us or misguide us. And so, when we have a certain urge, or inner leading from the Holy Spirit, we need to check that to see whether that feeling, that urge, is in harmony with the complete body of truths that the Holy Spirit has taught us in the Bible. Even though Christians insist that the Holy Spirit is fully divine, and that his works and personhood benefit us in many ways, we often don't praise him for these things in our worship, or even petition him in our prayers. In fact, some people even think it's inappropriate to pray to the Spirit. Are they right? How should we respond to the Holy Spirit in our worship and prayers? Some Christians wonder if we should pray to and worship the Holy Spirit. The Christian doctrine of the Trinity teaches that one God eternally exists in a unity of being as three persons. Because the Holy Spirit is God, it's right and appropriate that we not only pray to him, but honor him as God. Objections to worship the Holy Spirit sometimes arise from misunderstanding of his identity. There was an interesting dispute over worship of the Holy Spirit in the fourth century. In his book, On the Holy Spirit, Basil of Caesarea tells us that there were two liturgies that were used in his church. The first liturgy was praise to the Father, through the Son in the Spirit. A second liturgy was praise to the Father, with the Son, together with the Spirit. Some who were Arian in orientation objected to this liturgy because they really didn't believe the Holy Spirit was divine. But if as Scripture teaches, then we have good reason to believe that the Holy Spirit is divine, that it's appropriate that we express to him in worship, doxology, and praise his true nature. If we believe that the Holy Spirit is divine, the third person of the Trinity, then acknowledging the divinity of the Holy Spirit is truly important in our worship. Now unfortunately, much of our worship is often directed solely toward Jesus. We praise Jesus for what he has done. We thank Jesus for the forgiveness of our sins, and in doing that we forget that the one who brings the life of Christ to us is not the second person the Trinity. The One who brings the life of Christ to us, the benefits of his death, his passion, his resurrection, the reality of his ascended glory, is the Holy Spirit. In that regard then, our worship should be careful always to acknowledge that the Holy Spirit is the one through whom the Father and the Son bring the church to life, through whom the Father and the Son carry us in the midst of history to the culmination of the new heaven and the new earth. Now, practically speaking I think it works out in this way as we're choosing songs. From time to time we need to have songs that sing of the glory of the Holy Spirit. When we have affirmations or liturgies in which we have a litany of praise, we need to have portions of the litany, which lift the glory of the Holy Spirit along with that of the Father and the Son. When it comes to praying I think there's a certain formula that we could learn to employ, at the beginning or the ending of our prayers in which we would say, that we pray these things dear Father in the name of your Son Jesus Christ and by the power of the Holy Spirit who makes us alive unto you. In doing that we form this Trinitarian focus in our worship, so that we continually are able to meditate on the mystery of God, but also acknowledge the true and rightful divinity and worthy-of-worship nature of the Holy Spirit. The divinity of the Holy Spirit impacts our prayers in the sense that he is God, and since he is God he can be rightfully addressed in prayer. When we begin our prayers with praise, he should be acknowledged. We praise the Father, praise the Son, praise the Holy Spirit because he's the one who produces the character of Christ in us when we pray prayers of confession, confessing our weakness and inability to live up to who Christ is and what he wants of us. The Holy Spirit is the one who, by the fruits, reproduces who Christ is in us, and so we think of him and ask him to make us reflect more and more Christ. He is the tutor of the church and of each individual believer. He is the teacher, and so we call upon him and say, "Lord, teach me." And when we say, "Lord teach me," we are addressing the Holy Spirit. Christ's teaching is encoded in the Scriptures, but the Holy Spirit is the one who makes those teachings personal to us. So, in individual worship he is very much central, and in the worship of the church it is the Holy Spirit who incorporates individual believers collectively into the body of Christ. And so, he should be honored and extolled as we meet in local congregations since he is the one who bonds us together in unity as believers and makes us the church, the body of Christ, the temple of the Holy Spirit. Paul said that the church is the temple of the Holy Spirit. So, he should be acknowledged and praised centrally as we worship individually and corporately. The Holy Spirit is essential to the life of every Christian. Although the Apostles' Creed only mentions him briefly, the Creed still indicates the Holy Spirit's power and divinity. And as believers, we're free to acknowledge him in our worship and prayers. He lives in us, giving us comfort, support, and spiritual gifts. And he empowers us to serve God faithfully. We can be confident that through his illumination and inward leading, the Holy Spirit will guide us to live lives worthy of our calling. Dr. Donald Whitney is Associate Professor of Biblical Spirituality and the Senior Associate Dean of the School of Theology at The Southern Baptist Theological Seminary in Louisville, Kentucky.